1 v. (unpaged) : ill. ; 14 cm. Some illustrations engraved by Swain. 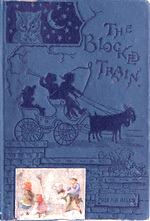 BY DODD, MEAD, & Co.
lit-tle girl ten years old. he walkedA h dif fi cul ty. chil-dren would go o-ver too. tell a sto-ry; so Mr. Case be-gan. ly at this sto-ry, and then Mr.
for a skate up-on the riv-er. to give up the chase." the fright he had giv-en him. train would start at once. -p-- -.-- - j .
to see my lit-tle broth-er Tom,"
Fan-ny and Kate," said Char-ley. -' ,' --3^ -- --- -- "
I; .-; i I ! a-bout on a shelf at his side. ing that the book was in-jured. to town. "Why not stay on,"
both-er of pack-ing up a-gain ? " kiss-ing his wife good-by, Mr.
is-ing to re-turn be-fore long. it in just the way we did."